PROVENCE, SOUTH OF FRANCE, MONACO, BERTIUS original antique miniature map 1618. 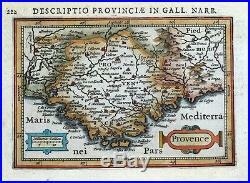 PROVENCE by Petrus Bertius Published Amsterdam 1618 in Tabularum Geographicarum Contractarum Libri Septem. An original early 17th century copper engraved miniature antique map of Provence, South of France by Petrus Bertius. The title is displayed in a strapwork cartouche with the further title of Descriptio Provinciae in Gall. In the upper margin. An attractive map of Provence which extends beyond Nice into Monaco and Italy in the east and westwards to Avignon and the Rhone Valley. Covers Toulon, Ventimiglia, Aix en Provence, Marseille, Is. De Hyeres, Cannes, Bormes, Sisteron etc. A crisp dark impression on robust hand laid paper with Latin text to verso. Enhanced with expertly crafted later hand colouring. Fine unmarked condition, free of repairs or restoration. It would be difficult to find a better example of this scarce map. 5″ x 4″ (140mm x 90mm). Map area only, with. Petrus Bertius 1565 -1629. Also known Pieter or Peter Bertius of Flemish birth he was educated at Leiden University and was a theologian, historian and mathematician of some standing, but is remembered chiefly for his cartographic works. His brothers in law Joducus Hondius. And Pieter Van Den Keere were also highly successful cartographers and engraved many of the maps for the Tabularum Geographicum Contractarum. A GENUINE ANTIQUE MAP GUARANTEED ALMOST 400 YEARS OLD FROM LINDISFARNE PRINTS. We do not deal in reproductions, facsimiles or modern copies of any kind. Personal cheque drawn on UK banks only. Postal Orders from UK post offices only. Lindisfarne Prints is a small family business specialising in genuine antique maps and prints at affordable prices. Established in 1995 and trading online since 2000, we pride ourselves on accurate descriptions, good communications, rapid service and fair prices. Powered by SixBit’s eCommerce Solution. The item “PROVENCE, SOUTH OF FRANCE, MONACO, BERTIUS original antique miniature map 1618″ is in sale since Thursday, April 19, 2018. This item is in the category “Antiques\Maps, Atlases & Globes\Europe Maps”. The seller is “lindisfarne2″ and is located in Shrewsbury. This item can be shipped worldwide.